This remarkable children’s book is probably more likely to wind up in your child’s classroom than at home. However, if it doesn’t, it’s a good one to look at for a child who likes reality. 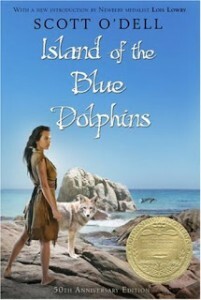 It’s a work of historical fiction about a young girl who is left alone on an island after her tribe leaves for other lands, and chronicles the ways she managed to survive. I don’t know how many of the details are accurate, but they are certainly believable and inspirational. Reading about a young girl who makes it her business to take care of things as best she can, is a great antidote to any one, of any age, who might decide to give up when things get hard. There’s no giving up in this book, and you wonder where that stamina comes from. Though the main character is a girl, the gender doesn’t play a huge role in it, and the cast-away theme would appeal to boys as well. A factual account of the real person (on which this historical fiction is based) can be found at the California Missions Website. I’ve personally witnessed a fourth grade Waldorf class reading this, and found that the students really loved the book. It inspired many children who were not strong readers to have a love for books. 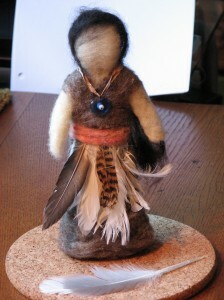 Here’s a Needle Felted Karana doll that I made for one of the students for her 10th birthday.